My head was still in wedding clouds this week as we returned from a weekend full of love and hugs from our large extended family. Our trip down to San Diego was busy and delicious, full of adventure, and scattered with plenty of tears, both joyous and reminiscent. There was ocean kayaking in La Jolla with my sister and her dearest friends, amazing food, and for the kids, we made time to visit Legoland. The rest of the weekend was spent with family from all over the country, celebrating one of the most touching weddings I have ever attended or been part of in my life. Everyone joked that Kleenex stock went up that weekend. If you’re a stockholder, you can thank me for that. You’re most welcome. Many of you have asked for pictures, and I will share some very soon. But today I wanted to share something just as sweet. As we drove up the corridor between Southern California and the Bay Area, the cool temperatures of San Diego were quickly replaced by triple digits. Between my exhaustion from the wedding and the heat, I gave myself permission to take a miniature vacation from cooking. There has been take out and old favorites that didn’t require arduous thought or photographing. And I have been enjoying my food fresh, and simply, which, as you know, is my preferred way of eating when it gets hot. On my first trip to the market this week, I replenished the pantry and the fruit bowls and I was especially delighted to find more beautiful figs. So today, I wanted to share my favorite way to enjoy them. 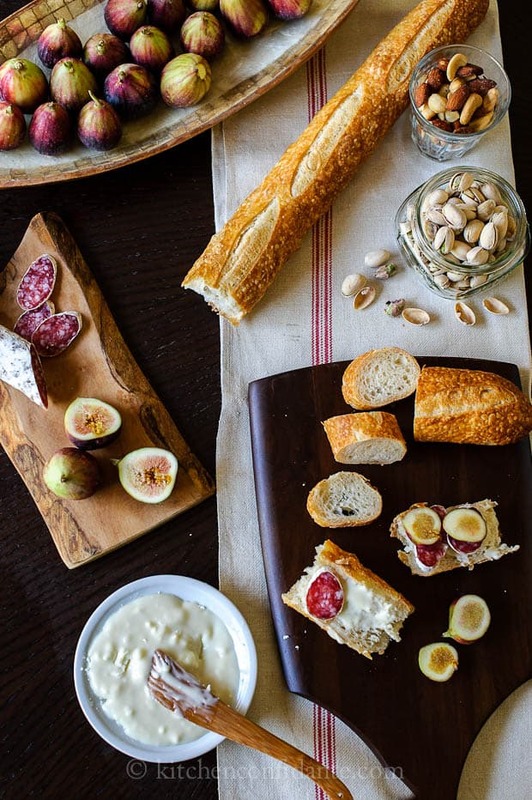 My version of Honeyed Goat Cheese and Figs can be found on Wayfair’s My Way Home, along with my ideas for entertaining simply…which is, by not cooking at all. Now, doesn’t that sound appealing? 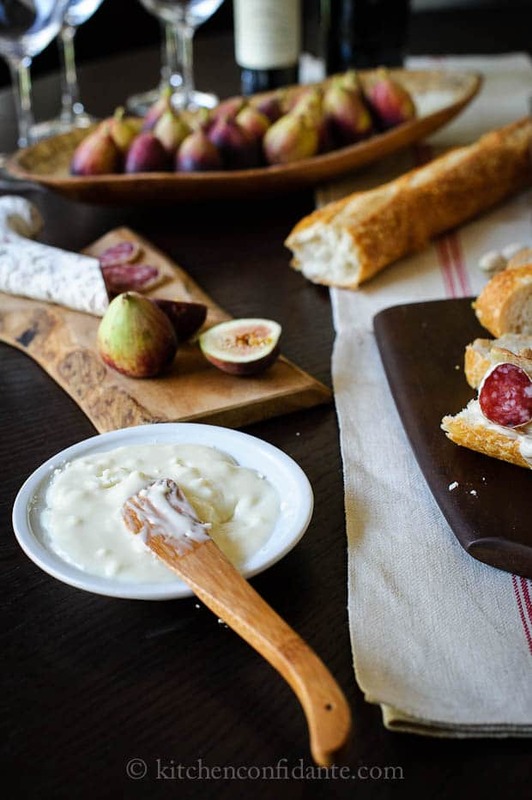 Recipe for Honeyed Goat Cheese and Figs can be found here. OH! And if you haven’t already entered, there’s still time to win a Cuisinart 14-Cup Food Processor! Giveaway ends the evening of Sunday, August 12, 2012. Wow, scary. My husband and I just had this for dinner tonight. I love this, Liren! So pretty and perfect for a warm (or hot!) summer night. I have fig envy :). 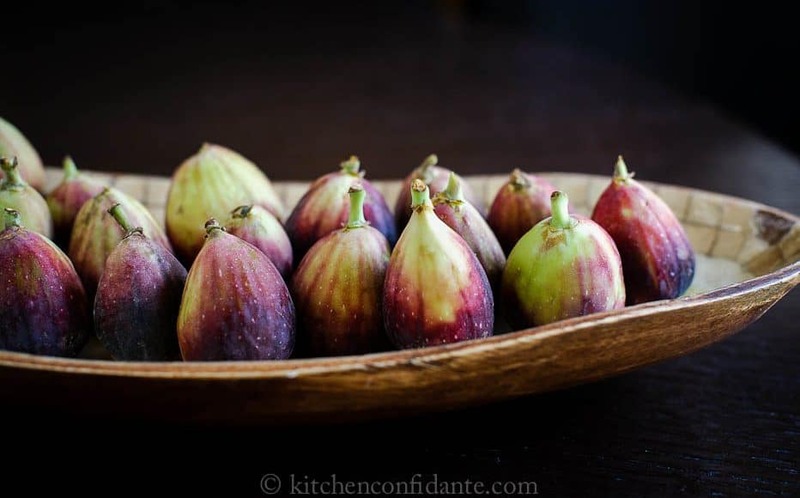 This was our favorite appetizer combination – until hubs had to cut out the cured meats, but I can still indulge at the restaurants I visit :) Absolutely gorgeous – I can always count on you for delicious fig ideas! P.S. Your sister and her husband make a beautiful couple!